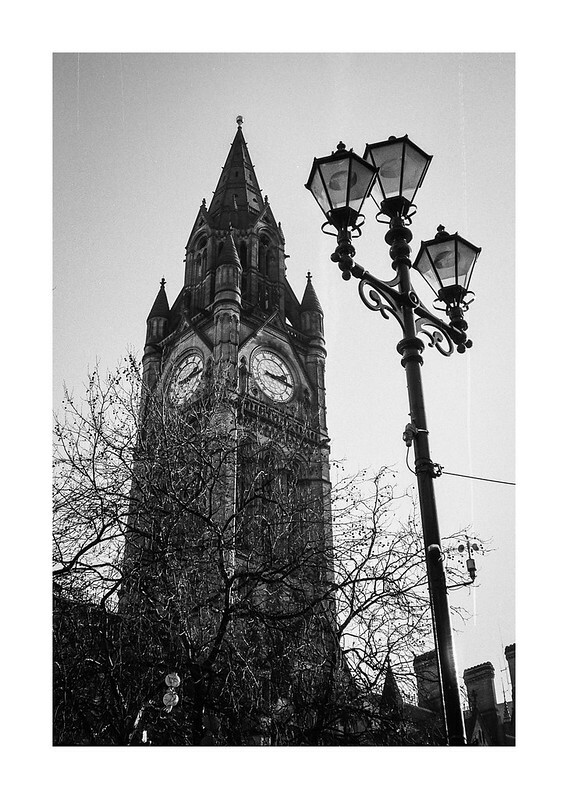 The clock tower of Manchester town hall. At first glance I thought there was a scratch on the negative to the right of the lamppost, but it’s actually a passing aircraft. The same with the two lesser marks at top left. I thought about removing them in Photoshop, but decided against it. 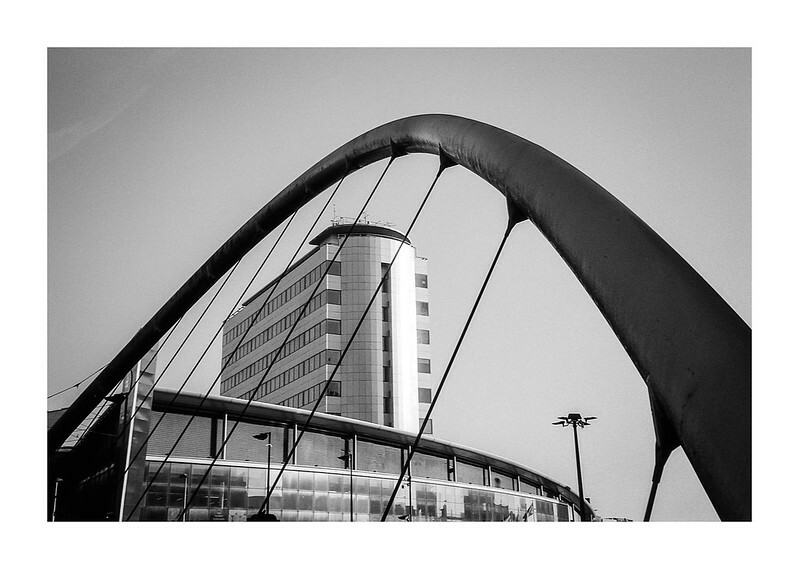 Taken on the way back to Manchester Piccadilly railway station the other week. 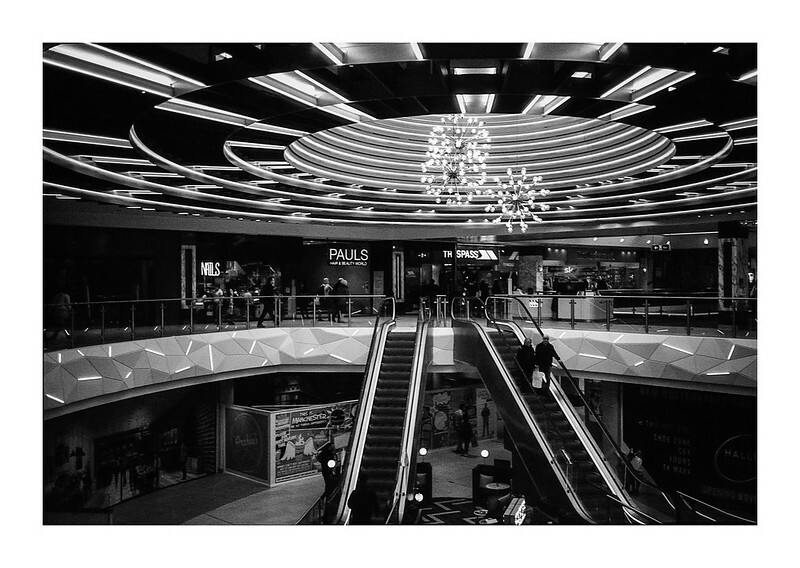 This is one of the main atrium / escalator areas in the Arndale shopping centre in Manchester, UK. The design of the overhead lighting was very striking and so I took the shot. Upon scanning the negative it reminded me of the climactic scene in Steven Spielberg’s classic movie, Close Encounters of the Third Kind, where the alien mothership descends at Devil’s Tower (although that had fewer retail outlets and escalators if I recall correctly… 🙂 ). 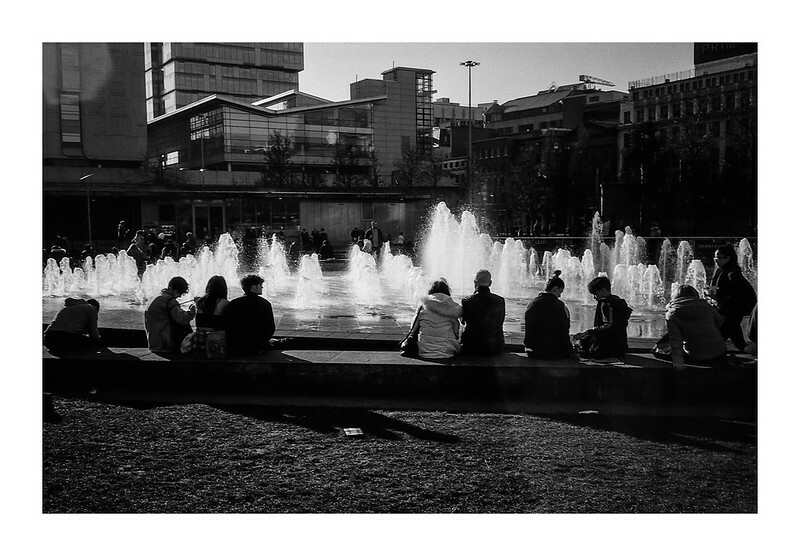 People enjoy the unseasonably mild February weather by the fountain in Picadilly Gardens, Manchester. The 35 RC’s lens had coped quite well with the conditions (shooting straight into the direction of the low sun). There’s some noticeable flaring in the shot (top left, and lower-centre right), but nothing too severe and the contrast has remained in place. 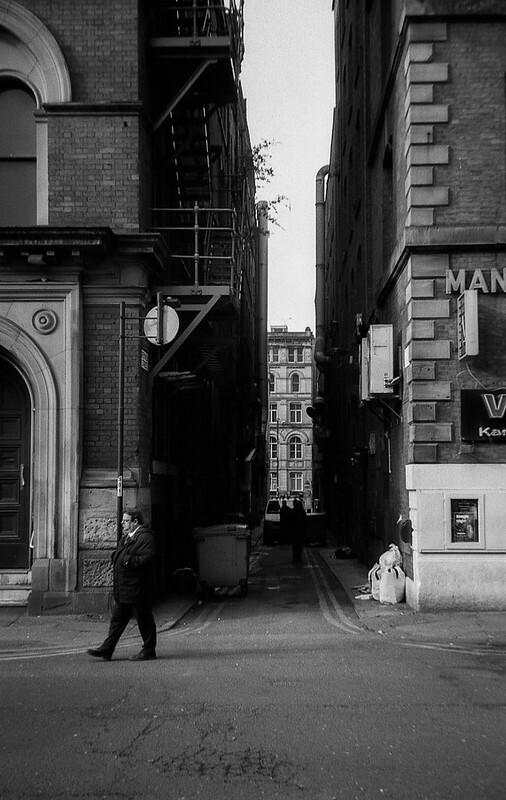 A couple of photos taken earlier this year when I had to attend a course in Manchester. As I had a little time each morning after getting off the train, I would wander the streets and take a few pictures with the camera I had with me (an Olympus Superzoom 105 G compact in this case). 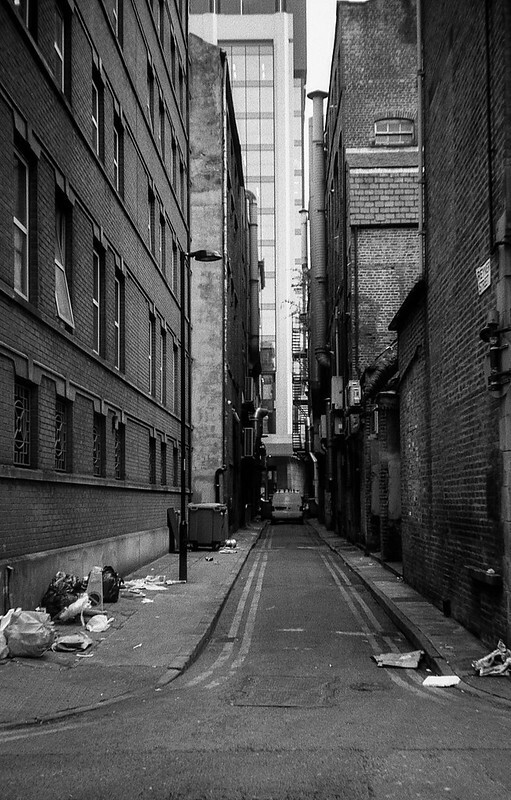 These are both of the same street, but from the opposite ends. Another of the occasional posts featuring a single shot, which I’m posting today primarily because I wanted to keep the flow of posts going on the blog, but haven’t yet gotten around to sorting out the pictures from the roll of Ektar I shot yesterday. So, here’s a random shot from a while back. 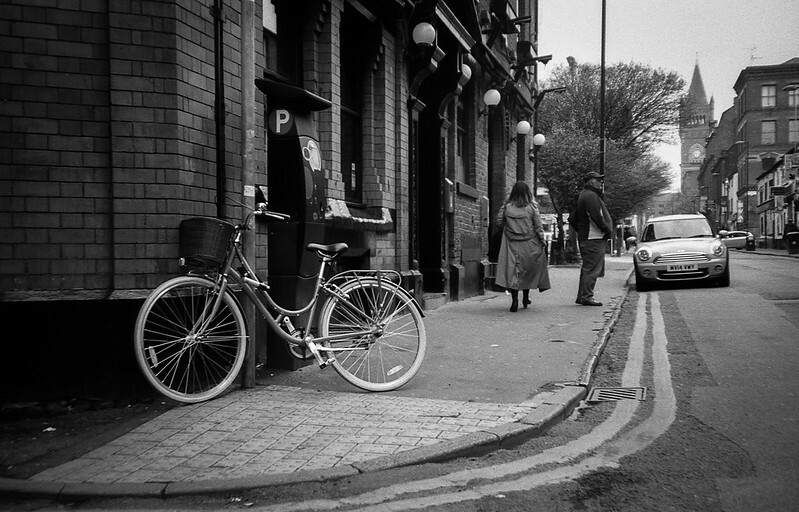 It was taken in Manchester while I was attending a training course, and as I was early on this particular day, I decided to take a circuitous route to the building where the course was being held. During the walk I spotted this little scene. It was the bicycle chained to the parking meter that drew my eye, but as I composed the shot I noticed the mini parked further up the street and made sure I included it in the frame, and I think the double-yellow (or grey in this case) lines lead you up to it and then to the distant tower of the crown court building. The two people add a dash of interest. It’s a shot that I think will age nicely as, although the parking meter and Mini are contemporary to now, they’ll look pleasantly old-fashioned a few decades hence. 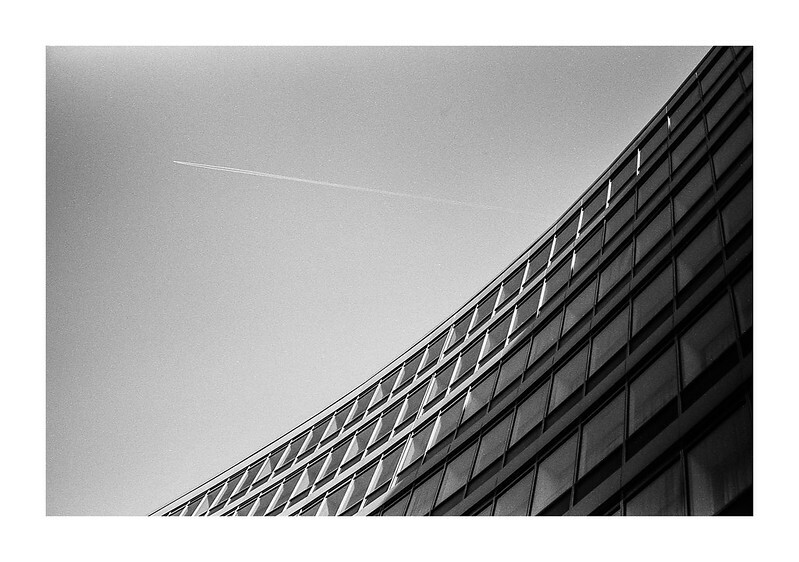 The camera used to take the shot was my cheapo Olympus Superzoom 105 G loaded with Fomapan 100. It’s not the sharpest of cameras, but it’s a very handy size and shape to just throw in a coat pocket when I’m out and about and, although I’ve not used it since finishing the roll of Fomapan, I can see myself picking it up again in future for similar trips out. The main downside I found was that the flash is automatically triggered in low light unless you first disable it, and I got at least a couple of unexpected flash bursts that I wasn’t expecting.